CSRA Ham Radio Blog | A weblog for hams and non-hams alike! A weblog for hams and non-hams alike! On Saturday September 9th from 1 to 4 pm we will be making comparisons with antennas in an uncontrolled environment. That’s right! No losers no winners. It’s all just for the fun of it all. The 2014 Bank of America Chicago Marathon notice is attached for all interested amateur radio operators in the Chicago area. Further information or questions will be covered at the CSRA general meeting on July 17th and on the Monday evening July 21st CSRA 2M net. We would like to invite you to join the Chicago Marathon Ham Radio support team. The 2014 Marathon will be held on October 12, and we are looking for your continued support to the 4000 medical volunteers and the 40,000 runners. Over the years, this ham radio community has been nationally recognized for the work we have done for the Chicago Marathon. Our support has been modeled by a number of similar events. I attribute this success to each you: your professionalism, and your collective sense of public service. There are a number of changes already this year. First, we will be missing a few of key volunteers. Many of you may know that Bill Rowe, AB9SV, a long time supporter of this event, became SK this spring. He will be missed. Meanwhile, a couple of back office stalwarts, Mike Freeman, KC9JBY, and Scott Irwin, W8UFO, both have accepted real jobs in other cities and are leaving us behind! They too will be greatly missed. This clearly speaks to the need for us to continue to develop new team members and build strong leaders to fill their shoes. Meanwhile, I took a FEMA sponsored Auxcom course this past May. It is designed for primarily to help ham radio operator’s better interface with public service professionals, both at emergency activities where we might be of service and at events just like this. I will be sharing some of what I have learned from that class and applying the best practices to this event (many of which we already do, I am glad to report!). We will be in touch to let you know your assignments and further instructions. Registration will close in mid-to late August so we can do the appropriate training and scheduling. We need new people! So please get the word out to your colleagues. We may have some new potential responsibilities. Also, this year, we will be asking for a few people to serve on a “strike” team. This is a group who will be held in reserve and assigned to work at almost at any aid station, where the need is greatest. Last year, due to illnesses and other issues, we had a couple of stations that were grossly understaffed. I want to thank everyone for their incredible support all of these years. I can’t believe we are starting our 6th year! Boys and girls: a disturbing story was relayed to me from a thoroughly credible source. One of our own was stopped in a suburban Cook County jurisdiction for supposedly using a cell phone while driving–he was on his handheld. 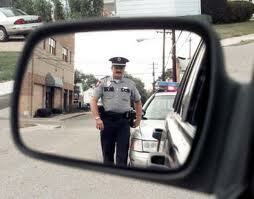 The officer was not aware of the exemption even though our guy’s vehicle had callsign plates. The driver also produced a copy of the law…then things got weird. The officer became irate that the driver was attempting to (patiently) explain the exception. The citation was written anyway. The bottom line here is that there is still a lot of ignorance in the field on our exemption’s place in the law. Regardless of what reality is, do not try and litigate this mess in the field. That’s what judges get paid for. If you’ve tried to explain the thing to the officer and it’s not penetrating, back off and take your day in court with the law in your hand. I’m going to do some things from the law enforcement end to push some education out to the field. In the meantime, there is nothing to be gained if you aren’t making yourself understood to the officer. Stand down, don’t make a bigger mess and see him in court. 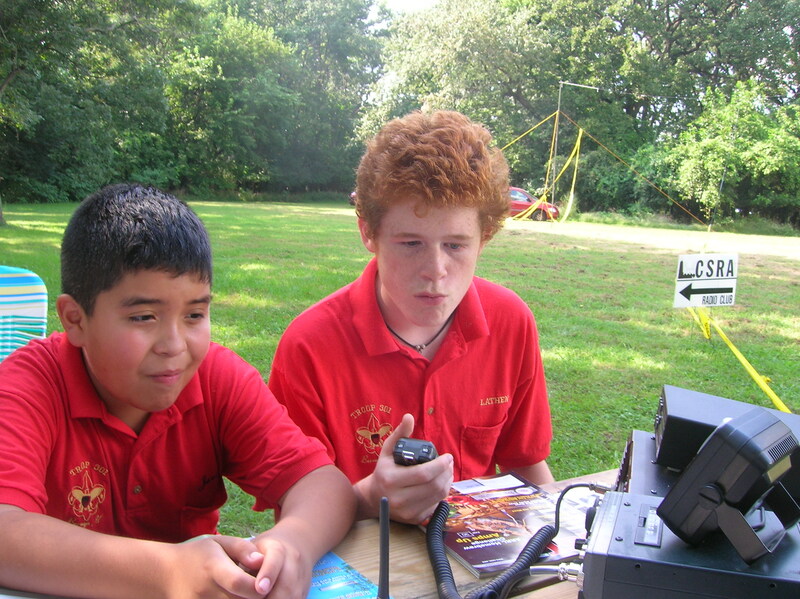 Members of the “Chicago Suburban Radio Association” demonstrated amateur radio to Boy Scout Troop 301 at the annual Berwyn Moose picnic on August 29th in North Riverside. CSRA members Scott Childers, Tom Mihm, Norman Malina and Jeff DeFrancesco set up temporary antennas and operated radio equipment, using generator power. The temporary station allowed the Boys Scouts to experience how ham radio operators are able to communicate across town and across the globe. Javier and Lathen operate the radio during the demonstration. During the demonstration, Scouts communicated with other hams as close as Kankakee, IL and as far away as Ukraine. Other contacts were made to operators in Whiting, IN, Little Rock, AR and even the island nation of Cuba. The scouts that showed particular interest in amateur radio will now work on obtaining their “Radio Merit Badge” and becoming licensed amateur radio operators. The Chicago Suburban Radio Association is Illinois’ oldest amateur radio club and welcome both hams and non hams to its monthly meetings. The Association meets on the third Thursday of the month at The Grace Lutheran Church, located at 1101 Manchester in Westchester at 7:30pm. For more details about the CSRA, logon to http://www.CSRAHam.com or call 630-575-9650. AT&T U-VERSE & RFI DON’T MIX! With AT&T U-verse service becoming more established in our area, some of my experiences with it may be of interest to other hams. My first incident of RFI with the system was actually interference between two components of the AT&T equipment itself! I am classifying this as RFI because it did involve a radiated signal from one device interfering with another and is not carried over the connecting cables. Backing up for just a moment here, the system installed basically consists of a separate modem that separates the telephone (VOIP), internet and cable television signals all being received off of your original copper wire telephone feed. The television is routed to digital receivers at each set, two being included in the basic package, with one master DVR box usually located at the first set closest to the modem location. The VOIP telephone is distributed via original wiring to all the phone jacks. The internet can be distributed via phone wiring, new cable or a wi-fi. There is also a battery backup unit located with the modem. A short time after our system was installed, I became aware of a tapping sound on the television audio and soon determined that it was present on most signals (goood luck trying to find any dead air time on most network channels in order to listen for this with non-stop wall of sound). I eventually noticed the tapping matched the pulse of one of the LEDs in the modem and simply repositioning the modem eliminated it. The next incident was a little more serious. Now I was chasing a dx’pedition which gave me plenty of opportunity to operate several different bands on phone and CW as well as a couple of times with the amp. It didn’t take long to finally completely blow away the U-verse. This was eventually easily solved by rerouting the CAT-5 cable (unshielded of course, you didn’t really think AT&T was going to install shielded CAT-5 did you?). The main offending mode was CW which apparently the modem saw as confusing digital signals on the input (can’t copy code?). Also, high power simply overloaded the line and caused the same thing, modem lockup. Keeping the AT&T cable away from proximity to my feedlines cured this problem. The tech who came out advised me they do have shielded cable but it is not on the trucks for general installation in homes. At least he knew what ham radio was, his brother is a ham. All is well with the world now, right? NO. Annoying burbles have been appearing in our bands for years now with the digital revolution but the one that was parking right next to the 20 meter Salvation Army daily net frequency was really starting to annoy me. However, I had lost the use of my old portable short wave radio and it seemed every time I went out to the mobile, the signal had moved or something. Finally the day came when I had the time to do some driving around and I could copy the offending signal on the mobile rig. It didn’t take much driving around to definitely locate the signal back to my QTH for sure. By this time I did have another portable SW receiver which was also capable of copying the signal and imagine my dismay when it zeroed in on the very northwest corner of my house! A veritable antenna! To keep this story short, the receiver on the upstairs tv was putting out an incredible amount of trash via the power cube back onto the house wiring. I eventually tried one of those little snapon ferrite cubes from Radio Shack and the signal was reduced enough to live with but still not completely gone. Now comes the big mistake. I found that the tech who did the original installation had left another power cube that had not only a ferrite cube snapped and tie wrapped on the low voltage cable, but it also had a large core on the 110v cord with the cord wrapped through it several times. AHA! (did I steal that from Oprah?). AT&T must have had some problems and maybe this was a fix for me too. Finally got everything together and connected and guess what? 20dB over S9 noise was what! The next time I had the hours that I knew talking to AT&T would take, I made the fateful call. In the meantime I found yet another issue for them to fix. My vintage all analog Signal One transceiver would knock out the VOIP phone on 40 meters. My Ten-Tec Orion at the same power level did not. A low pass filter had no effect and I also verified that it was the signal off of the antenna and not something radiated in the shack which is right below the location of the U-verse equipment in the room upstairs. Of course the phone tech had to attempt what I told him would be useless procedures of reprogramming the modem over the lines. This only shifted the burble up frequency and did nothing to stop the 40M signal getting into the totally unshielded equipment. After blowing him off the phone three times with the radio he finally accepted this and contacted his supervisor for “permission” to send out a real live tech. All of this ate up a good hour or more to prove that I knew what I was talking about and the phone tech had no grasp of the technicalities involved, obviously not a radio guy. Imagine my disappointment when upon arrival and listening to my explanation, the real live tech told me that 1. no one in their department knew anything at all about rfi issues, read no training whatsoever, and 2. he knew of no parts, filters or anything else for curing rfi being available from the company. He asked me what I could think of instead! After showing him my tests, demonstrating the offending signals and my filter on the receiver power cube, describing the loss of phone service when running the particular transmitter, etc. he just flat out stated that I knew more about this stuff than he or anyone else in his department including his supervisor! He also allowed that he thought this ham radio stuff was just about the coolest thing he had ever seen and told his supervisor the same thing in very excited tones. I went back upstairs and removed the “filtered” AT&T cube from the one receiver (the tech took one look at it and said that those had caused interference problems between the modems and the DVRs and weren’t being used anymore) reinstalled my ferrite snapon and watched the noise drop way back down and went for a cold beer. He also told me that most of the technicians had finally been told about the tapping noise problem finally and knew to solve it the same way I did. What a relief, I followed accepted company practice! I am now waiting for a burst of inspiration which may be some time in coming as I write this. If and when I solve all of this to my complete satisfaction, rest assured that AT&T will not be the first folks I go running to with the answers. At least not for free. I will get it all published in a ham radio forum and then offer my services to AT&T as a retired old dog engineer with some common sense and real world experience. The price? Still up in the air but believe me, it will be worth my while for the time and aggravation. Oh, the manufacturer of this mighty fine equipment? This is all the better stuff they went to from CISCO. Guess CISCO could use a couple of old engineers over there too, any takers? My first advice to them is get out of the ham bands and then shield the boxes. I would be embarrassed if something I designed for a system interfered with another part of the same system. And they just raised the equipment charge for this junk!